My role as the director of adult education is unique in that it allows me to work very closely with the congregation to help develop and cultivate a deeper love for God’s Word. I am tasked with not only the responsibility of teaching classes but also overseeing and developing the equipping of other teachers and leaders to do the same. These are the duties that are visible to the church. Behind the scenes, I typically have my nose in books or am writing curriculum. As I sit down to wrestle through some of the more complicated issues with the anticipation of creating a workable curriculum for the layperson, my time has to be strategically spent. This is nearly impossible to do effectively without the ability to study all day long. And given my current schedule, you can remove the “near” from that statement—it’s just impossible. At least it was prior to integrating myWSB.com into my daily workflow. Before using myWSB I would essentially be chained to my desk for hours on end, often to the early hours of the morning, trying to read as much as I could to get the best understanding that I could, so that I could effectively write the course curriculum and then communicate the content clearly. Sure, I always had the ability to bring a book with me to work to read at lunch, but I could never bring my entire library. But with myWSB I can simply log on to my account and access my entire WORDsearch library from my work computer, or from any computer for that matter. No installation or downloads are needed. I have instant access to hundreds of commentaries, dictionaries, Bibles, and more. My entire WORDsearch library is at my fingertips at all times. 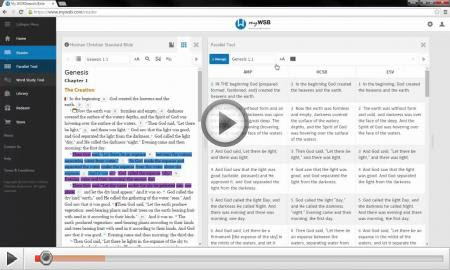 Not to mention the Parallel Tool for reading parallel Bible translations and the Word Study Tool for quick access to word usages and definitions. This season of my life is busy. I’m a husband to an amazing woman and the father of three young, energetic children. I’m a bi-vocational minister working to provide for my family and those that God has entrusted to my care. With myWSB, I not only have the ability to bring greater depth to my daily study, but I save time and energy as I seek to put the results of that study to paper. Now I can come home from work and spend more time with my family knowing that when the kids go to bed I already have a head start on my next project.